John's Tree and Landscaping is looking forward to building an ongoing relationship with Heytanksla.com to further the importance of capturing and retaining water, this vital resource, for both residential and commercial properties. Please read on and visit Heytanksla.com for more information. Our company was born from a desire to keep California green and sustainable for future generations through Rainwater & Greywater Harvesting and Low Impact Development (LID) systems. Our mission is to educate the public about the region's water plight and to offer and inspire attainable design solutions. We do this through: Education and raising public awareness, consultation and design, as well as the installation and maintenance of every system we develop. Our Rainwater and Greywater harvesting systems are unique to the Los Angeles metropolitan area as we strive to use the most advanced and sustainable local vendors and rainwater catchment systems in the industry. 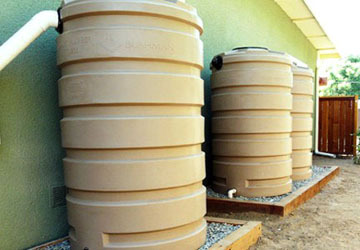 We design and install rainwater catchment systems throughout the Los Angeles area and surrounding counties. While almost any contractor can divert your downspout into a cistern, a sys-tem needs to be well designed, well built and well maintained in order to function properly and save you headaches down the road. Designing and building rainwater collection systems is how we started our business. From 50 to 50,000 gallon tanks, we offer a wide range of options; keep-ing in mind your goals of the system, application, and integration with your environment. We install above and below-ground systems made of polyethylene, fiberglass, precast concrete, and corrugated steel. Systems can often be modular to accommodate space challenges. We regu-larly install BUSHMAN, Rainwa-ter HOG, GRAF, XERXES, JENSEN PRECAST, ATLANTIS SYSTEMS, as well as custom-built designs. Most are used for landscape irrigation, however we aim to accommodate all benefi-cial uses for your harvested rainwater. We encourage designs that utilize gravity when possible, but if a pump is necessary-we'll do the calculations and install one. Further, we encourage designs that overflow and spread to landscape before reaching the storm drain. You may purchase our products separately through our store. When you purchase items from us, keep in mind we don't sell anything we haven't installed. We have first hand experience with every product we sell. 1" of rain x 1 sq. ft. = 0.623 gallons or 1" of rain from 1,000 sq. ft. will provide 623 gallons. You can find the 30-year Average monthly rainfall for your area by visiting the NCDC link here: www.ncdc.noaa.gov/oa/climate/online/ccd/, as well as other useful cal-culators on our resources page. There, you can also find a list of government rebates and CSM Rain Harvest Rebate Application.